Young institutes attract young faculty. And often, young faculty have young children. With new research campuses being situated far from city centres or in small towns, childcare options are thin on the ground. IISER Bhopal is one such campus, situated in a tier-2 city, some distance away from the city’s centre. Not surprisingly, there are far fewer daycare options that faculty can avail of compared to their colleagues in Mumbai or Bangalore. During a chance conversation, Vinita Gowda, a young faculty at IISER Bhopal, told me about the challenges the situation presented and the solutions they devised in-house. The government mandates that institutes must have a crèche, but guidelines or standards for their creation or functioning are not laid out clearly and unequivocally. The onus of setting up a quality crèche/daycare is often on the faculty, and it is no surprise that women scientists often lead the charge in this respect. IISER Bhopal was established in 2008 in a makeshift campus and moved to its new campus in 2012. 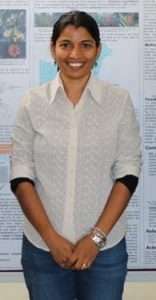 Vinita Gowda, who studies plant evolution and ecology, joined the Department of Biological Sciences. “When I joined [in 2013], I was a new mother and a good daycare facility was indispensable to me,” said Gowda. Seeded by funding from the Institute, the facility is housed in a spacious building and is run internally, following a cooperative model. Aadharshila caters to children from six months to seven years of age. In addition to classrooms, there is a library, a sleeping area, a play area and even an audio-visual room. What really makes a difference to quality are the team of teachers and caregivers. Finding trained teachers for a school far away from the city center was no cakewalk in Bhopal. It was here that Anjali Singh, wife of Director Vinod Singh played a key role. Mrs. Singh had taught high school students for 16 years in Kanpur, going on to become a Principal of the school. She used her connections to bring in teacher trainers from Vadodara to offer practical training at Aadharshila and keep teachers current on teaching trends and methods. “IIT Kanpur had a private crèche but there were fewer women faculty and many faculty wives stayed at home when their children were young. IISER Bhopal has many more working women, so a good crèche becomes very important,” said Singh to me over a phone conversation. The daycare also caters to kindergarteners. They have pre-KG and LKG classes, and plan to start UKG next year. “The campus is far away from town schools. It’s not easy for parents to send their toddlers on long commutes and coordinate school drop-offs and pick-ups during working hours,” said Gowda. Having on-campus options for early schooling makes their lives a whole lot easier. “As researchers, we place a high premium on education. The quality of education we can provide our children is of high priority,” added Gowda. Availability of good daycare and schooling options will be attractive to prospective hires, so Institutes must pay heed. An eight-member committee oversees the facility—five of them are faculty, both male and female. In addition to the high standard, fees at Aadharshila are also modest—staff pays lower fees for their wards—they hope the facility will be self-sustaining in a few years. “It is not uncommon for Institutes to outsource daycare to an established brand. But a good daycare really needs caring people. Keeping that in mind, we sought to create our own brand, one that suits our needs best,” Mrs. Singh concluded.